Kimchi is a process of seasoning and preserving vegetables. There are hundreds of varieties each specific to a region’s locality. The process itself is quite simple, but the craft of it comes from understanding these variations and knowing how to treat each ingredient differently. The art, must surely come from our interaction with the invisible biome of fermenting bacteria, the faith and slow working of time and the open conversation with our nature. What if I don’t have some of the ingredients? Korean chilli flakes are sun dried and have a smoky, sweet taste. They also do not contain the seeds, so the heat is measured and warm. They are flaked, not powdered, so that they give off their colour while remaining distinct. What you end up with is a medium hot, striking red kimchi. You can purchase Korean chilli flakes from most Asian supermarkets as well as some online ones, such as orientalmart.co.uk or souschef.co.uk. If you want to use something you have already at home, I would recommend using something without the seeds , or if with the seeds then in a much smaller ratio. It’s important to note that chillis aren’t native to Korea, and all kimchi was white upto a certain point. A lot of kimchi still is made without chilli. So you can omit it altogether! I’ve met folks who’ve opted for smoked paprika in the past. You can also use fresh red chillis and slice them very thinly without the seeds, for a bit of colour and heat. What is the starch water for, and do I have to use sushi rice? You can certainly use other white rice - the water ratio may be different, and the flavour will somewhat change, but you will still have the starch. The starch is essentially a little boost of food for the lactobacillus as well as some other fermenting bacteria. It also adds a mellow flavour and some texture to the sauce. It is used in different amounts depending on when and with what the kimchi is made. In Korea, as well as most Asian cuisine, rice is king. High quality grains cooked right can be as delicious to our taste as freshly baked sourdough. It is savoury and mellow, nourishing, with a moreish chewy texture. Korean rice is specific, and you may achieve better flavour using it, but it’s definitely not a must. Korean cuisine in its ethos is not dissimilar to the Mediterranean. We have an abundance of mountains and coast and are fairly low in latitude. In spring, we mainly eat fresh vegetables steamed or fried and seasoned gently. I remember distinctly having a meal that consisted of half a dozen side dishes, all varieties of what we would consider weeds, in varying dressings of sesame, perilla, garlic, pepper and salt. In this way, we too put our emphasis on doing little to our produce and eating it simply. The difference stems from our winters and the evolved culture of fermentation. Our winters see much snow and freezing temperatures. And so over time, we came to preserve and ferment the abundant glut of produce over growing seasons. Another key difference is the relationship of our produce with aspergillus oryzae, a key bacteria for the creation of soy bean paste and soy sauce. So in this way, kimchi is one of many ways in which we capture a certain time of year. To the day. A baechu cabbage will be seasoned with chilli grown and dried under the hot sun, with aromatics that are abundant, and the cabbage picked when it is full of life and in celebration of the weather. We put it away, and in the cold months, we are reminded of that day. Fermentation and kimchi, in this regard, can be a principle, a value, an attitude. We don’t need to save our glut and prevent our waste in the same way as we used to when we farmed our food. Well, except that we probably do. We probably create more waste than we did before but it remains out of site. In any case, it makes for a healthier, more varied and delicious larder. Kimchi makes up a bapsang, a setting, a spread. You could think of it as not dissimilar to thali. Instead of one plate that we individually eat from (though we do this with certain broths or noodle dishes), most often we have a spread that consists of side dishes, rice, soup or stew. I always remember my grandmother’s fridge, with its multitudes of side dishes waiting to be brought out in whatever combination we fancied, to go with a simple main dish of grilled fish or meat, or a broth. Because we have these ferments, dishes that have been ticking away and developing for months or even years, a Korean bapsang is full of varying textures and seasons. A fresh, lightly steamed namul dressed lightly in perilla oil may sit next to a deep, salty pickle. The steamy, chewy rice is seasoned with a sauce that has been looked after and cared for years. In practical terms, it also means that we don’t necessarily cook each time we eat. Most of our meals are bolstered by dishes that have been made in the past, steadily developing in flavour. I think this is an important thing - because with different cultures of food, there are different cultures of eating. There are different cultures of growing, cooking. Really, there are different cultures of time. If you are making kimchi as a one off, it may seem odd and out of place to spend an hour then wait three weeks to eat it. But if you take on something of the culture, then you may find that you make a lot of things in advance, and on a rainy day, you only need to pull out a few dishes sitting in your fridge to have a delicious meal. The contrast, variety and sharing is a key element of Korean food. I hope over the year, as we release recipes, you may find your fridge filling up with delicious treats! Water kimchi or ‘mul kimchi’ is typically made in the spring and summer, fermented at room temperature for a day then 1 - 2 weeks in the fridge. It is served cold, with the brine and usually not stored for too long, as often the vegetables become too watery. Though not suitable for the wet autumn we are having, it is a simple kimchi that you can tackle with readily available ingredients. It is easy to ferment and refreshing. Wash your cucumbers. With a sharp knife, cut straight through the cucumber along its length, leaving an inch at each end so that you end up with a straight slit through the middle.and the cucumber still intact. Repeat this, making another incision perpendicular to the first. *If you don’t have a large enough container for whole cucumbers, you can either use three times the number of pickling cucumbers or cut the whole cucumbers in half and follow the instruction above. Salt generously and place on a colander with a heavy weight on top for 30 minutes to an hour. Rinse a couple of times in running water and squeeze out as much liquid as you can. Cut the filling ingredients into thin, 3 cm long match sticks and mix thoroughly with the seasoning ingredients. Stuff your cucumbers and place into a suitable container with a heavy weight on top. Fill with a brine of roughly 5% salinity (so 100:5 ratio of water to salt) to a level roughly an inch above your cucumbers. Seal your container and ripen at room temperature for 24 hours, then in your fridge. Taste after 1 week for the sour taste of the lactic ferment. Serve cold, with some of the fermented brine. Submerge the garlic cloves in vinegar and leave for 7 days in fridge. Prepare your brine by bringing the soy sauce, stock, sugar and salt to boil. A veg stock with ginger, garlic, peppercorns and dried chilli works well, and you may also add soju or sake at this point. Add your garlic to the cooled brine and leave at room temperature. After 3 to 4 days, strain the brine and bring to boil, skimming any impurities. Add the garlic back to the cooled brine and leave for a further 2 to 3 weeks in the fridge, until the garlic is suitably fermented. You can preserve whole bulbs of garlic if using wet, young garlic. Simply peel away a few layers of the tougher skin, leaving the less fibrous skin intact. You can also keep garlic stems when they first produce flower buds, which do not require the initial steep in vinegar. Make sure that you use parts of the stem that are edible and not fibrous. Baechu is the Korean word for what is commonly known as napa cabbage or Chinese leaf in the UK. 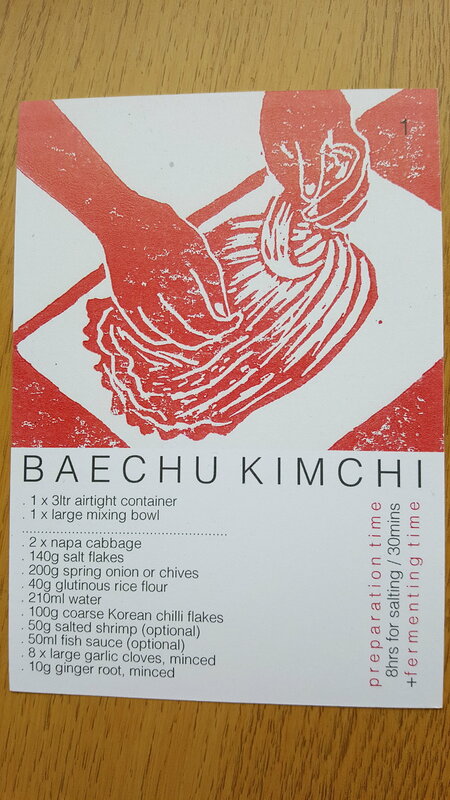 It is perhaps the most popular kimchi dish, but surprisingly baechu is not a native crop in Korea and was introduced in late 19th century, while chillis were introduced in the 17th century. Koreans have however been making kimchi for thousands of years and have over three hundred different recipes. If you think of it as a process, then we may also invent new kimchis the world over, responding to each unique environment and season. *the rice water provides starch for the lactic acid bacteria to help fermentation. You can either simmer and cool a mix of 40g rice flour or plain flour with 210ml water or use 250ml of excess starchy water from cooking any white rice. **the fish sauce and shrimp is optional, and you are welcome to use instead 100ml of brine. Season to taste - you want it to be slightly too salty to taste. Orientalmart.co.uk is a good, cheap website to source any ingredients you can’t find, though we do recommend experimenting with what is around you. Korean chilli flakes are simply sun dried, and so slightly smokey, and without seeds. Korean shrimp and the fish sauce are simply there to add extra flavour, and you can use vegetable stock or other flavourings instead, as well as adding more garlic and ginger. The only thing to pay attention to is the salt level, and providing some starch to help with the fermentation. Remove any withered outer leaves of the cabbage. Cut in half vertically and rinse. Salt the cabbage by parting each leaf and throwing across a heavy pinch of salt. Salt heavier towards the base where the leaves are thicker. Leave in the fridge for 8 hours. The leaves should be soft and easy to bend. Rinse carefully a few times under running water, then firmly squeeze out most of its liquid. Slice the spring onions and chives into thin, 2 inch strips and combine with the rest of the seasoning ingredients. Spread the seasoning thoroughly across one side of each leaf. Rinse the seasoning bowl with 50ml of water to add to your container later. Place into a sealed container leaving an inch at the top and gently press down to release any air. Add the remaining mix of water and seasoning to your container and seal. You can either place a heavy weight on top to help release the gases produced as your kimchi ferments, or every few days press down with clean hands. Ripen at room temperature for 24 hours, then place at the bottom of your fridge for 2 to 3 weeks. The flavour will continue to develop and grow more acidic as time passes. Kimchi can be eaten raw, mild or very ripe and can be stored for many months. Sour kimchi also makes for a great ingredient in stews and stir fries. As a general rule you can use the recipe for the seasoning to make kimchi with most vegetables. Certain vegetables require different seasoning or ripening. The main difference usually is in the salting process. Turnips, squash and other dense vegetables require 2 to 3 hours of salting. Leafy greens such as spinach and chard require a mere 10 to 20 minutes. Hardier, less watery cabbages require 2 to 4 hours, and may need some trimming around the thicker ridges.